Background: Nigella sativa has been a nutritional flavoring factor and natural treatment for many ailments for so many years in medical science. Earlier studies have been reported that thymoquinone (TQ), an active compound of its seed, contains anticancer properties. Previous studies have shown that TQ induces apoptosis in breast cancer cells but it is unclear the role of P53 in the apoptotic pathway. Hereby, this study reports the potency of TQ on expression of tumor suppressor gene P53 and apoptosis induction in breast cancer cell line Michigan Cancer Foundation-7 (MCF-7). Methods: MCF-7 cell line was cultured and treated with TQ, and 3-(4,5-dimethylthiazol-2-yl)-2,5-diphenyltetrazolium bromide (MTT) assay was carried out for evaluating the half-maximal inhibitory concentration (IC50) values after 24 h of treatment. The percentage of apoptotic cells was measured by flow cytometry. 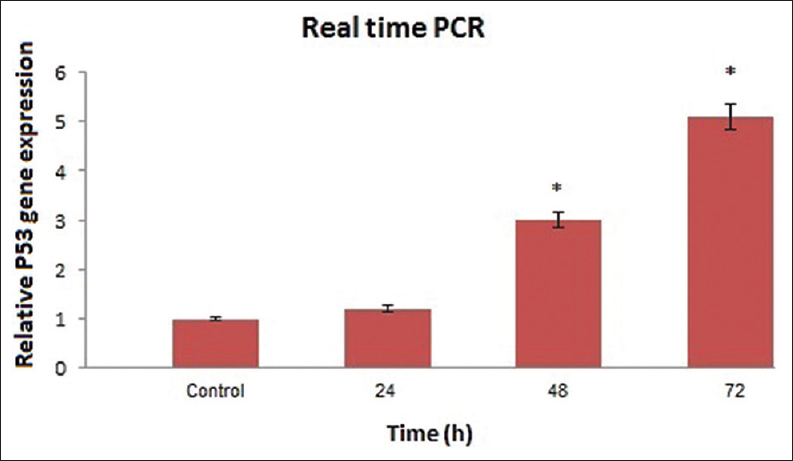 Real-time polymerase chain reaction (PCR) was performed to estimate the messenger RNA expression of P53 in MCF-7 cell line at different times. Results: The IC50 value for the TQ in MCF-7 cells was 25 mM that determined using MTT assay. The flow cytometry and real-time PCR results showed that TQ could induce apoptosis in MCF-7 cells, and the P53 gene expression was dramatically up-regulated by ascending time, respectively. Hence, there was significant difference in 48 and 72 h.
Conclusions: Our results demonstrated that TQ could induce apoptosis in MCF-7 cells through up-regulation of P53 expression in breast cancer cell line (MCF-7) by time-dependent manner. Breast cancer is the most common cancer among women worldwide and it has been reported that each year about 502,000 die from the disease. , Breast cancer originates in the breast but metastasizes to other distant organs such as bone, lungs, and brain. Global statistics showed that by the year 2020, there will be twenty million new cancer patients every year. Herbal medications are the source of many chemotherapeutic agents and it has also been demonstrated to have anti-neoplastic potential (Nigella sativa, paclitaxel, vincristine, etc.). Thymoquinone (TQ) is as a potential chemo preventive and chemotherapeutic compound of oil of the black seed. Many investigations have shown that TQ has anti-inflammation, anti-hypertensive, anti-asthmatic, anti-microbial, and anti-oxidant effects. ,, In addition, anticancer properties of TQ have also been reviewed and has been found that TQ applies anticancer effects (both in vitro and in vivo) in various patterns of carcinogenesis. , In earlier works, it was found that TQ prevents the growth of different types of cancer, including breast adenocarcinoma (multi-drug-resistant Michigan Cancer Foundation-7 [MCF-7]/TOPO, MCF-7, MDA-MB-231, and BT-474), , lung cancer (NCI-H460 and A549),  pancreatic cancer (MIA PaCa-2, HPAC, and BxPC-3),  and prostate cancer (LNCaP, C4-2B, and DU145). ,, Several lines of studies have determined that TQ exhibits antimetastatic effects, and it can inhibit angiogenesis, in a way that, this compound was found to prevent C26 colon cancer cell invasion. Moreover, some other studies have reported that TQ was able to suppress tumor growth in PC-3 prostate cancer cells, probably through angiogenesis inhibition and it can cause to significant reduction in the number of blood vessels in the tumor. TQ has shown little effect on noncancerous cells such as mouse fibroblasts,  prostate epithelial cells,  human normal intestinal cells,  and human normal lung fibroblasts. This result shows that TQ may have beneficial effects in different types of malignancy while has little effect on normal human cells. Shoieb et al. found that TQ induces apoptosis in osteosarcoma cells and also decrease the number of cells in S-phase. Hence, it induces the cell cycle arrest at G1-phase. Other investigations have demonstrated that TQ can induce apoptosis via p53-dependent/independent pathways. ,,, In spite of TQ good anti-neoplastic activities, the molecular mechanism of its pharmacologic effects is not fully understood. Gali-Muhtasib et al. investigated the effects of TQ against HCT-116 human colon cancer cells. They found that TQ induced apoptosis by up-regulating p53 and the downstream p53 target gene, p21WAF1. Roepke et al. have shown that TQ induce apoptosis by p53-independent pathway. Regarding increasing incidence of breast cancer in developing countries like Iran, many investigations have done on different cell line of breast cancer and many different ways have supposed for TQ induced apoptosis. Hence, in the present study, we hypothesized that TQ may up-regulate activity of P53 gene in breast cancer cell line MCF-7 that has a wild-type P53, and inhibit tumor cell growth. Human breast cancer cell line (MCF-7) was purchased from the national cell bank of Iran-Pasteur Institute. TQ was purchased from Sigma (C6499, USA). Cell line used in the present study was cultured in Dulbecco's modified Eagle medium-F12 medium (Sigma) supplemented with 10% fetal bovine serum (Sigma) and 1% penicillin-streptomycin (Sigma), and incubated at 37°C and in humidified atmosphere containing 5% CO 2 . TQ was dissolved in minimum volume of dimethyl sulfoxide (DMSO) (2%) as working solution were prepared by adding of adequate water to reach the appropriate concentrations according to reported procedures. , After the cells were >80% confluent and growing exponentially in flask 75, 10 5 cells (MCF-7) were counted and plated in flask 25 and kept in culture medium for 24 h which were then incubated with certain concentrations of TQ, based on half-maximal inhibitory concentration (IC50) index, at different times (24, 48, and 72 h). All the quantitative data were presented as the mean ± standard deviation. Repeated measure analysis of variance with post hoc test was performed to determine the statistical significance among different groups using the SPSS software package 20.0 IBM modeler (2009). Significance was accepted at a level of P < 0.05. After the treatment of MCF-7 cells with MTT solution in this study, the dark blue formazan crystals were seen in cells, which indicated their metabolic activity. The reduction in the number of cells was dependent on the cell type as shown by the IC50 index. The IC50 value for the TQ was established. 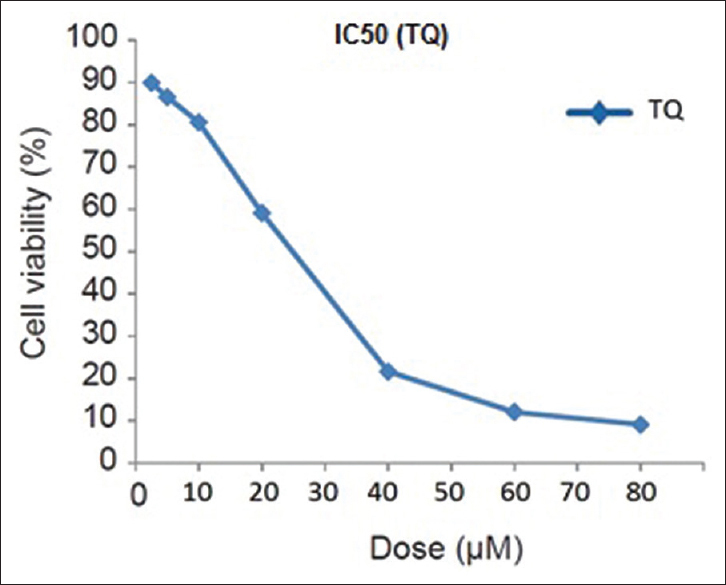 The results showed that the essential TQ concentration to achieve the IC50 in MCF-7 cells at 24 h was 25 μmol/L [Figure 1]. To establish the anti-apoptosis potential of the TQ, we first investigated the effects of TQ on the proliferation in MCF-7 cells. 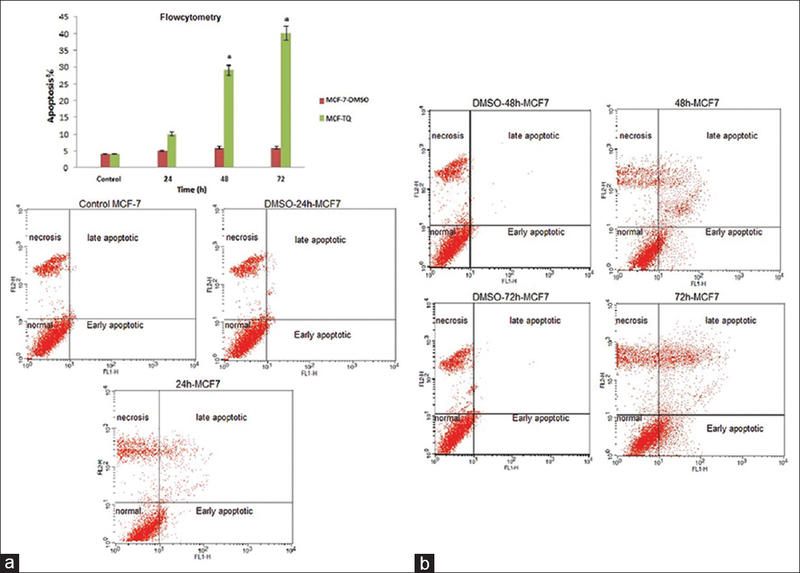 The flow cytometry results showed that TQ at different time points (24, 48 and 72 h) could induce apoptosis in MCF-7 cells, and it was increased with ascending time. TQ arrested MCF-7 cells proliferation (40% of inhibition) in 72 h and (approximately 30% of inhibition) in 48 h [Figure 2]a and b, P < 0.05]. DMSO was used in the control sample (vehicle drugs). Using Dunnett test, average of apoptotic cells at different times were compared with the control group. Groups 48 h and 72 h had significant difference to the control group (*P < 0.05). It was suggested that apoptotic induction in cancer cells by TQ requires the activation of P53 gene expression. To examine this hypothesis, we used MCF-7 cell line, as cancerous cell line. We examined the inhibitory effects of 25 μmol/L TQ (based on IC50 index) at different times on the mRNA expression of P53 in MCF-7 cell line. The P53 gene expression was dramatically up-regulated by ascending time, in particular, at 72 h treatment its expression was increased significantly [Figure 3], P < 0.05]. Using Dunnett test, average of P53 gene expression at different times was compared with the control group. Groups 48 h and 72 h had significant difference to the control group (*P < 0.05). Taken together, our results indicated that TQ inhibited breast cancer cell proliferation in a time-dependent manner. Also, for the first time, we have shown that TQ induce apoptosis through activation of the P53 pathway in MCF-7 cell line. Further, it is required to evaluate the effect of TQ on prevention and treatment of breast cancer. The results showed that the drug's effect was significant at 48 and 72 hours. Finally, TQ treatment for 72 hours would have to make the most of apoptosis by expression of P53 gene and it's Resumption of activities apoptotic. Considering the valuable properties of the drug, can be hope to the emergence of a new strategy in the fight against cancer. Autier P, Boniol M, Gavin A, Vatten LJ. Breast cancer mortality in neighbouring European countries with different levels of screening but similar access to treatment: Trend analysis of WHO mortality database. BMJ 2011;343:d4411. Montazeri A, Vahdaninia M, Harirchi I, Harirchi AM, Sajadian A, Khaleghi F, et al. Breast cancer in Iran: Need for greater women awareness of warning signs and effective screening methods. Asia Pac Fam Med 2008;7:6. Coley HM. Mechanisms and strategies to overcome chemotherapy resistance in metastatic breast cancer. Cancer Treat Rev 2008;34:378-90. Burits M, Bucar F. Antioxidant activity of Nigella sativa essential oil. Phytother Res 2000;14:323-8. Ravindran J, Nair HB, Sung B, Prasad S, Tekmal RR, Aggarwal BB. Thymoquinone poly (lactide-co-glycolide) nanoparticles exhibit enhanced anti-proliferative, anti-inflammatory, and chemosensitization potential. Biochem Pharmacol 2010;79:1640-7. Kruk I, Michalska T, Lichszteld K, Kladna A, Aboul-Enein HY. The effect of thymol and its derivatives on reactions generating reactive oxygen species. Chemosphere 2000;41:1059-64. El Gazzar M, El Mezayen R, Marecki JC, Nicolls MR, Canastar A, Dreskin SC. Anti-inflammatory effect of thymoquinone in a mouse model of allergic lung inflammation. Int Immunopharmacol 2006;6:1135-42. Effenberger-Neidnicht K, Schobert R. Combinatorial effects of thymoquinone on the anti-cancer activity of doxorubicin. Cancer Chemother Pharmacol 2011;67:867-74. Gali-Muhtasib H, Ocker M, Kuester D, Krueger S, El-Hajj Z, Diestel A, et al. Thymoquinone reduces mouse colon tumor cell invasion and inhibits tumor growth in murine colon cancer models. J Cell Mol Med 2008;12:330-42. Woo CC, Loo SY, Gee V, Yap CW, Sethi G, Kumar AP, et al. Anticancer activity of thymoquinone in breast cancer cells: Possible involvement of PPAR-g pathway. Biochem Pharmacol 2011;82:464-75. Rooney S, Ryan MF. Effects of alpha-hederin and thymoquinone, constituents of Nigella sativa, on human cancer cell lines. Anticancer Res 2005;25:2199-204. Kaseb AO, Chinnakannu K, Chen D, Sivanandam A, Tejwani S, Menon M, et al. Androgen receptor and E2F-1 targeted thymoquinone therapy for hormone-refractory prostate cancer. Cancer Res 2007;67:7782-8. Koka PS, Mondal D, Schultz M, Abdel-Mageed AB, Agrawal KC. Studies on molecular mechanisms of growth inhibitory effects of thymoquinone against prostate cancer cells: Role of reactive oxygen species. Exp Biol Med (Maywood) 2010;235:751-60. Richards LR, Jones P, Hughes J, Benghuzzi H, Tucci M. The physiological effect of conventional treatment with epigallocatechin-3-gallate, thymoquinone, and tannic acid on the LNCaP cell line. Biomed Sci Instrum 2006;42:357-62. Woo CC, Kumar AP, Sethi G, Tan KH. Thymoquinone: Potential cure for inflammatory disorders and cancer. Biochem Pharmacol 2012;83:443-51. Ivankovic S, Stojkovic R, Jukic M, Milos M, Milos M, Jurin M. The antitumor activity of thymoquinone and thymohydroquinone in vitro and in vivo. Exp Oncol 2006;28:220-4. El-Najjar N, Chatila M, Moukadem H, Vuorela H, Ocker M, Gandesiri M, et al. Reactive oxygen species mediate thymoquinone-induced apoptosis and activate ERK and JNK signaling. Apoptosis 2010;15:183-95. Gurung RL, Lim SN, Khaw AK, Soon JF, Shenoy K, Mohamed Ali S, et al. Thymoquinone induces telomere shortening, DNA damage and apoptosis in human glioblastoma cells. PLoS One 2010;5:e12124. Shoieb AM, Elgayyar M, Dudrick PS, Bell JL, Tithof PK. In vitro inhibition of growth and induction of apoptosis in cancer cell lines by thymoquinone. Int J Oncol 2003;22:107-13. Gali-Muhtasib H, Diab-Assaf M, Boltze C, Al-Hmaira J, Hartig R, Roessner A, et al. Thymoquinone extracted from black seed triggers apoptotic cell death in human colorectal cancer cells via a p53-dependent mechanism. Int J Oncol 2004;25:857-66. Gali-Muhtasib H, Roessner A, Schneider-Stock R. Thymoquinone: A promising anti-cancer drug from natural sources. Int J Biochem Cell Biol 2006;38:1249-53. Chehl N, Chipitsyna G, Gong Q, Yeo CJ, Arafat HA. Anti-inflammatory effects of the Nigella sativa seed extract, thymoquinone, in pancreatic cancer cells. HPB (Oxford) 2009;11:373-81. Roepke M, Diestel A, Bajbouj K, Walluscheck D, Schonfeld P, Roessner A, et al. Lack of p53 augments thymoquinone-induced apoptosis and caspase activation in human osteosarcoma cells. Cancer Biol Ther 2007;6:160-9. Liu G, Chen X. Regulation of the p53 transcriptional activity. J Cell Biochem 2006;97:448-58. Gregoretti IV, Lee YM, Goodson HV. Molecular evolution of the histone deacetylase family: Functional implications of phylogenetic analysis. J Mol Biol 2004;338:17-31. Yang T, Fu M, Pestell R, Sauve AA. SIRT1 and endocrine signaling. Trends Endocrinol Metab 2006;17:186-91. Motaghed M, Al-Hassan FM, Hamid SS. Cellular responses with thymoquinone treatment in human breast cancer cell line MCF-7. Pharmacognosy Res 2013;5:200-6. Crijns AP, Gerbens F, Plantinga AE, Meersma GJ, de Jong S, Hofstra RM, et al. A biological question and a balanced (orthogonal) design: The ingredients to efficiently analyze two-color microarrays with confirmatory factor analysis. BMC Genomics 2006;7:232. Parkin DM. Global cancer statistics in the year 2000. Lancet Oncol 2001;2:533-43. Velho-Pereira R, Kumar A, Pandey BN, Jagtap AG, Mishra KP. Radiosensitization in human breast carcinoma cells by thymoquinone: Role of cell cycle and apoptosis. Cell Biol Int 2011;35:1025-9. Mukherjee AK, Basu S, Sarkar N, Ghosh AC. Advances in cancer therapy with plant based natural products. Curr Med Chem 2001;8:1467-86. Schuppan D, Jia JD, Brinkhaus B, Hahn EG. Herbal products for liver diseases: A therapeutic challenge for the new millennium. Hepatology 1999;30:1099-104. Rajput S, Mandal M. Antitumor promoting potential of selected phytochemicals derived from spices: A review. Eur J Cancer Prev 2012;21:205-15. Randhawa MA, Alghamdi MS. Anticancer activity of Nigella sativa (black seed) - A review. Am J Chin Med 2011;39:1075-91. Torres MP, Ponnusamy MP, Chakraborty S, Smith LM, Das S, Arafat HA, et al. Effects of thymoquinone in the expression of mucin 4 in pancreatic cancer cells: Implications for the development of novel cancer therapies. Mol Cancer Ther 2010;9:1419-31. Salem ML. Immunomodulatory and therapeutic properties of the Nigella sativa L. seed. Int Immunopharmacol 2005;5:1749-70. Cecarini V, Quassinti L, Di Blasio A, Bonfili L, Bramucci M, Lupidi G, et al. Effects of thymoquinone on isolated and cellular proteasomes. FEBS J 2010;277:2128-41. Evan G, Littlewood T. A matter of life and cell death. Science 1998;281:1317-22. Badary OA, Abdel-Naim AB, Abdel-Wahab MH, Hamada FM. The influence of thymoquinone on doxorubicin-induced hyperlipidemic nephropathy in rats. Toxicology 2000;143:219-26. Mansour M, Tornhamre S. Inhibition of 5-lipoxygenase and leukotriene C4 synthase in human blood cells by thymoquinone. J Enzyme Inhib Med Chem 2004;19:431-6. Salim EI. Cancer chemopreventive potential of volatile oil from black cumin seeds, Nigella sativa L. in a rat multi-organ carcinogenesis bioassay. Oncol Lett 2010;1:913-24. Nobel CS, Burgess DH, Zhivotovsky B, Burkitt MJ, Orrenius S, Slater AF. Mechanism of dithiocarbamate inhibition of apoptosis: Thiol oxidation by dithiocarbamate disulfides directly inhibits processing of the caspase-3 proenzyme. Chem Res Toxicol 1997;10:636-43. Gali-Muhtasib HU, Abou Kheir WG, Kheir LA, Darwiche N, Crooks PA. Molecular pathway for thymoquinone-induced cell-cycle arrest and apoptosis in neoplastic keratinocytes. Anticancer Drugs 2004;15:389-99. Duan S, Tsai Y, Keng P, Chen Y, Lee SO, Chen Y. IL-6 signaling contributes to cisplatin resistance in non-small cell lung cancer via the up-regulation of anti-apoptotic and DNA repair associated molecules. Oncotarget 2015;6:27651-60.